Latitude 38.660046 & Longitude 34.853611. 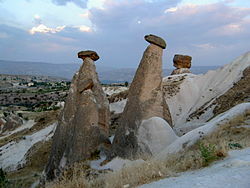 On the Anatolian Plain in the Zelve region of Cappadocia, some 140 miles south-east of the capital city Ankara and 2 miles north-east of Goreme, stand the famous Rock Cones of Urgup, with hundreds of naturally-formed rock citadels: pinnacles, cones, domes, columns and pyramid-shapes, resembling giant mushrooms, which are known locally as Fairy Chimneys. Since the 4th century Christian ascetics have sought sanctuary in some of the larger rocky structures and carved out churches and chapels from them, indeed some of the rock faces, nearby, have some quite astonishingly ‘beautifully’ hewn-out places of refuge and worship, while underground there are literally hundreds of subterranean cave-like dwellings, with passage-ways linking rock-cut rooms and buildings, many on different levels, with boulders that could be rolled into position across doorways in case of attack. 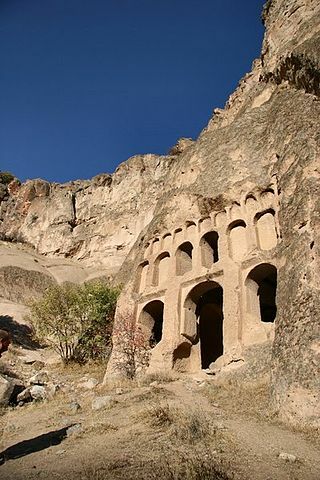 But going further back – in the 1st century AD St Peter the Apostle is said to have brought Christianity to Anatolia, and then in the 4th century St Basil, bishop of Caesarea (now called Kayseri, 50 miles to the east), urged monks and hermits who were fleeing from persecution to follow an ascetic life on the Plain of Urgup and the Goreme Valley, nearby. There are many hundreds of rock pinnacles, resembling lofty chimneys that seem to nearly touch the sky in places, which have been shaped by erosion and the softer rock around them gradually worn-away over millions of years to form the alien, moon-like landscape of today; many of the pinnacles being over 100 feet high (30-40 metres) and having windows and doorways, many even being joined together to form communities of people, with many more having churches and chapels built inside them. And below ground there are vast cavenous-like structures: tunnels, galleries, and passage-ways, with several different levels of underground buildings and rock-cut rooms. The main entrances have large boulders standing ready in position so that they could be rolled across in case of an attack from the outside, and if any would-be invader did get inside they would find the maze of passage-ways bewildering, if not down-right dangerous, and they would be dealt with in due course! A few of the larger, more interesting churches still retain their original medieval frescos, a lasting tribute to the monks and hermits who painted them many centuries ago. These underground towns, cities, and communities of people would have been largely self-sufficent; they even had their own stables attached – both above and below ground, and also their own water supply through pools and large stone tanks. However, by the 13th century the rock chimneys of Urgup were being abandoned, and only a few solitary hermits and priests continued to live here in an equally solitary residence, but the man-made rock churches and chapels did continue to be ‘in use’ until more recent times, and today they are a tourist attraction, with some 600 or so churches surviving both at Urgup and at nearby Goreme – including the churches of St John the Baptist, St Barbara, St Basil, Church of the Apple and Tokali. “Today the process of erosion continues, slowly wearing down the pinnacled landscape and exposing the multi-coloured layers of earth. These range from the palest tufa, through tones of ochre, russet and deep chestnut (caused by mineral impurities), to the black of the basalt.” Another Reader’s Digest publication ‘Book of Natural Wonders’, tells a similar story. Reader’s Digest, Strange Worlds Amazing Places, The Reader’s Digest Association Ltd., London W1X, 1994. Reader’s Digest Book Of Natural Wonders, The Reader’s Digest Association, Inc., New York, 1980. Michael’s Guide Turkey, (series editor: Michael Shicor), Inbal Travel Information Ltd., Tel Aviv, Israel, 1990. 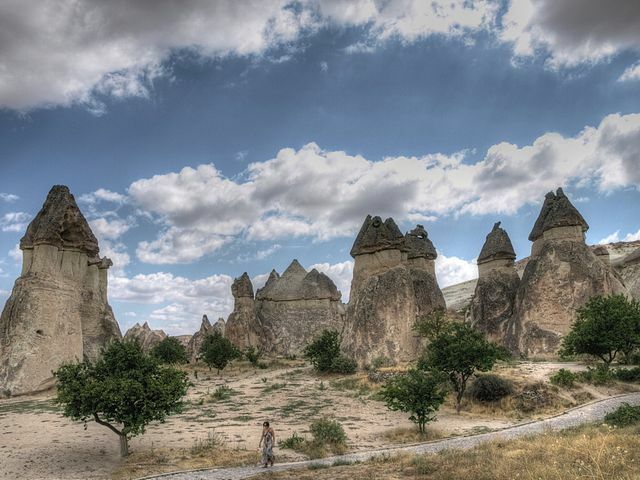 Categories: Misc Subjects, Rock Formations, Underground Churches | Tags: Rock Churches of Urgup in Turkey, The Rock Cones Of Urgup in Cappadocia Turkey | Permalink.